Russia is modernizing its missiles in response to US plans; while Obama in his own words says ” I will cut investments in Defense priorities, unproven missile defense systems. I will not weaponize space. I will slow our development of future combat systems. And I will institute an independent “Defense Priorities Board” to ensure that the Quadrennial Defense Review is not used to justify unnecessary spending.” http://missilethreat.com/archives/id.7086/detail.asp There is also a you tube video but embedding has been disabled by Obama for America. 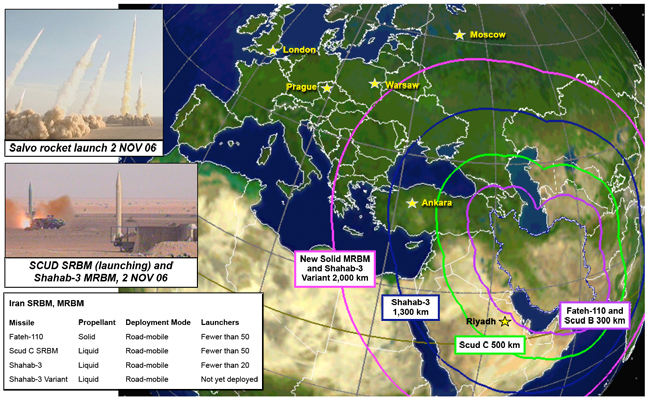 http://missilethreat.com/missilesoftheworld/ Countries almost from A-Z have ballistic missiles, from Argentina to Turkey and of course, the United States but Russian officials have threatened to point nuclear missiles at the countries that will allow U.S. missile defense sites on their territory. May 16, 2008 “President Dmitry Medvedev made his debut as the commander in chief of Russia’s armed forces Thursday, touring a missile base and promising to provide the funding needed for nuclear forces to counter global threats.” http://www.1913intel.com/tag/missile-base/ Russia is ramping up its nuclear forces and Obama wants to reduce funding and encourage Russia to do the same saying that if they negotiate, we won’t have sanctions against them . Russia does not need the United States. According to Obama, missile defense is unproven? 13 out of 14 tests were successful hits! Alaska, home to VP Sarah Palin has three Army Posts Fort Richardson, Fort Wainright and Fort Greely .Army’s Alaska Installation Guide http://mags.aqppublishing.com/showmag.php?mid=srrdr&spid=-2#/page2/ can be found here and it resembles more of welcome to Alaska Welcome Wagon Publication thatn a Military publication. The main website http://www.greely.army.mil/sites/local/ Sarah Palin as Governor of Alaska is pretty well versed whith what is going on in her state and its relationships between the Armed Forces Group of IMCOM- Installation Management Command and SMDC, Space Missile Defense Command out of Colorado Springs, CO. I have to believe she has more knowledge than That One, who as a Senator is doubtful to have ever even set foot in Alaska unless it was a fishing trip. http://mags.aqppublishing.com/showmag.php?mid=srrdr&spid=-2#/page2/ Missile defense seems a fairly reliable, deployable asset in keeping America safe and yet Senator Obama is full of promises to sit down and talk with anyone willingly- with absolutely no preconceived notions that a country could have ulterior motives. Azerbaijani mentioned he’d like to wipe Israel off the map and. “Ever since the 1991 Gulf War, Syria, Iran, Egypt and Iraq have been struggling to build offensive missile capability in the face of Israel’s growing nuclear arsenal. Israel is estimated to have as many as 400 atomic and hydrogen weapons. The Israeli Air Force has three squadrons equipped with Jericho nuclear-tipped missiles at the Sedot Mikha base, 45 km south of Tel-Aviv. They can reach all major Arab cities, Iran, and Russia. Israel also has a large number of gravity nuclear weapons, possibly including neutron bombs. http://www.twf.org/News/Y1997/IsraelMissile.html America also has a base on Isreali soil thanks to an agreement with President Bush. Just take another look at who is leading in the Polls http://www.barackobama.com/pdf/Defense_Fact_Sheet_FINAL.pdf. I think Russia should have every right to upgrade its missile capabilities when the US decides to put a missile base right on its border.